Your landing page is the “face” of your website. It’s the first thing people see and your best chance to make a strong impression. It’s also a critical point in the customer journey process. If you get someone’s e-mail, you can send them marketing messages repeatedly. This multiplies your chances of getting their business. If the opposite happens and a user leaves without leaving you their contacts, your chance of engaging them is greatly diminished. For this reason, it’s critical to maximize your landing page conversions. But this is wildly inaccurate. To give you an idea of how important forms are, consider this. With just one tweak to his landing page form, SumoMe’s Noah Kagan boosted conversions by 26%. Want to know what that tweak was? 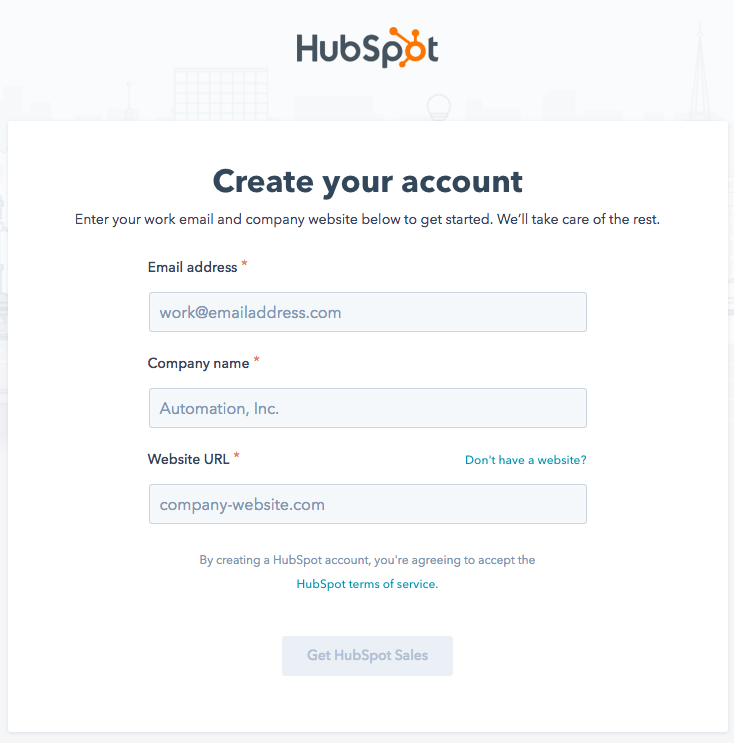 Then you’re in the right place – because you’re about to discover seven form tips that’ll make your conversions skyrocket. (Noah’s is #1). As recently as 5-7 years ago, it was common for a website to ask 4+ questions before giving users access to a freebie. 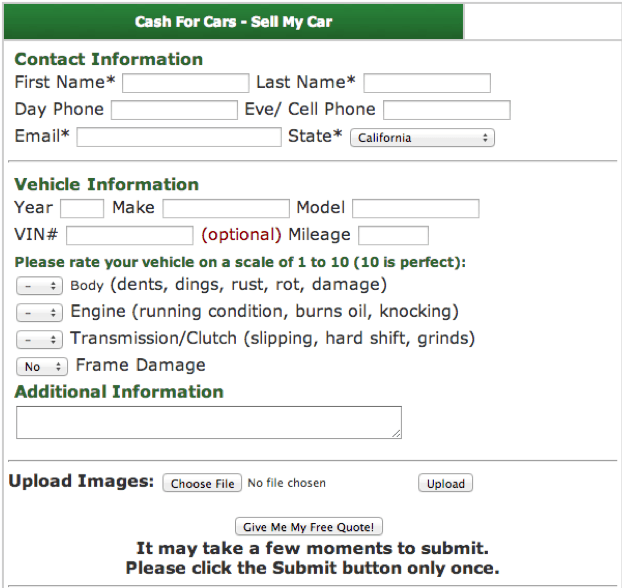 Just look at the form cash4usedcars.com’s users had to fill in to get a free quote! Today, things are different. We know that the less fields a form has, the more likely it is to be completed and submitted. The trick Noah Kagan used to get that 26% increase in conversions? Dropping the number of fields on his landing page from 4 to 3. That’s it! Really think about that. Asking for one extra piece of information lifted conversions by more than a quarter. Crazy, right? So what you want to do is figure out which fields are important to you and your customers. (The latter is important because removing the fields users like hurts your engagement and conversion rate). Once you’ve figured that out, eliminate any unnecessary forms so you’re only asking for the really important stuff. Marketing guru David Ogilvy once said that for every 10 people reading your headline, only 2 get to the end of your content. Nobody knows if this exact statistic applies to landing page forms, but we can tell you one thing with certainty. Form headlines are critical to converting leads. The headline is where you tell people why they should submit the form. If you fail to do this effectively, users have no reason to complete this process. This, as you might imagine, kills conversions. 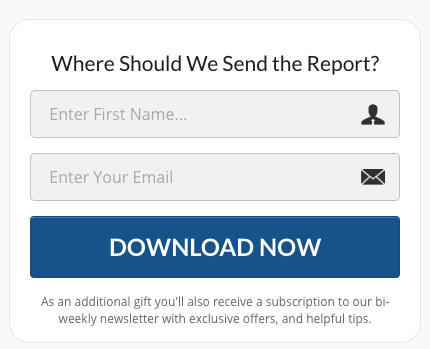 If you look at our own landing page, the headline is actually outside of the form – but that’s not the important thing. 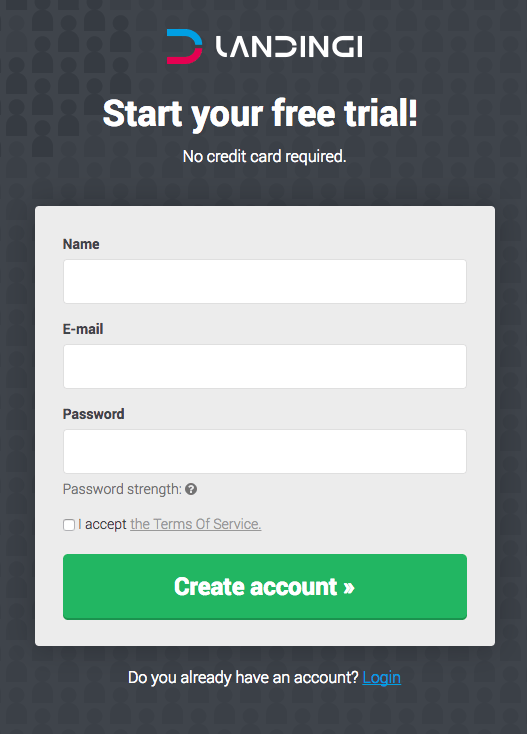 What’s important is, our headline clearly lets people know what they’re about to get by completing the form (a free trial). The headline is where you make a big promise and otherwise persuade people to complete your form. The small print is where you overcome potential objections and put people’s minds at ease. In the image above, our small print is actually in our subheadline. This is because we wanted to emphasize that users can register without giving us their card details. However, the norm is to put the small print at the bottom of your opt-in page; either below the box or below the last field. The addition of terms & conditions in the small print increases the page’s perceived authority a lot like our “no credit card required” does on our registration page. Other common blurbs include “we’ll never share your information with anyone”, “we respect your privacy”, or the name of the billing company that processes your payments. Anything that elicits trust for your brand works. Users may not read what’s on your page – but once they read your headline, 90% of them read your CTA copy as well. This means that the headline and the call to action are the two places almost everyone reads… i.e. The most important parts of your form. So what do you put in your CTA? We recommend clear and actionable instructions like “Download Now!” or “Get My Free Basket!”. Avoid formal phrases that provide no information, e.g. “Continue” or “Learn More”. This point might seem silly at first glance, but Conversion XL ran 3 tests – and found that red buttons get more interactions than green ones every time. This is counterintuitive, since most people associate green buttons with “yes” or “go”… And yet it’s true. That’s why you may want to give some extra thought to the color of your button. A minute change could leave to a single or double-digit difference in conversions. In one study, pointing arrow icons to CTA buttons resulted in a 26% conversion boost. Based on our years of experience, we’d say this result is overstated – but it’s certainly true that visual elements improve conversion rates. The second is to use photographs where a person’s line of sight points users to your CTA. Believe it or not, this is a highly effective way to draw someone’s attention to a specific spot on your page – and you can effective examples of it in marketing here. If you’re part of a high-ticket brand, you may feel these methods are unsightly, or detract from the overall design of your page. This is likely true – but then, the whole point of visual cues is to be a little obtrusive and point people where you need them to look! In his Stanford address, Steve Jobs highlighted that the Apple Mac was the first computer with beautiful typography. This was no coincidence; Jobs personally spent a lot of time designing those first fonts. Because he understood that they’re huge for a page’s visual appeal. It was true in the 80s, when Jobs was making the first Graphic User Interface – and it’s true for your landing page forms now. The Kissmetrics blog has a wonderful post about picking the best fonts, but you may find it easier to simply Google “best font combinations” and save yourself the effort. 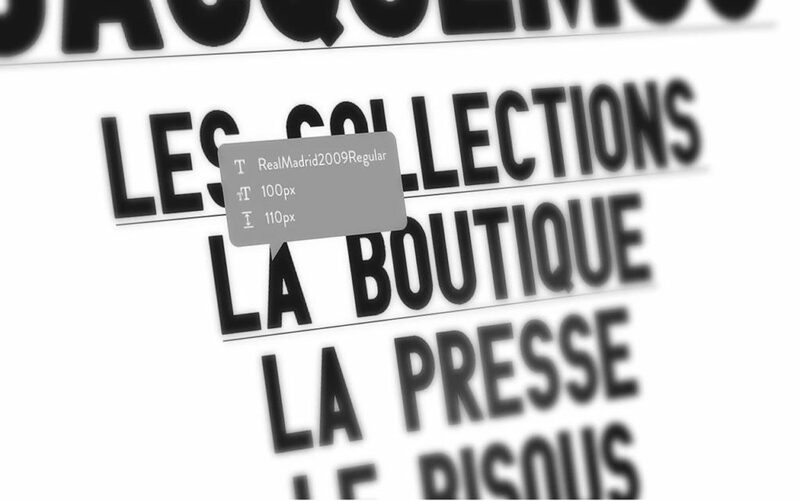 Alternatively, install Chrome extension FontFace Ninja to see what other websites are using – and adapt their fonts to your form! Check out this form. The icons in the fields look cool, right? While we urge you not to make forms that overflow with oversized images, using in-field icons, as well as small graphic elements, is never a bad thing. The human brain processes images in as little as 13 seconds, and using them in your form will increase engagement. In the vast majority of cases, all the elements we’ve gone over so far are enough to maximize your conversions. However, if you feel that adding a little extra test is necessary – or will help engage users – then you can certainly go for it. The first place you should consider adding text is to the subheadline, which goes below your headline. If that’s not enough space, add your blurb below the subheadline. Just make sure it doesn’t distract people from the flow of the form as a whole. Combine these 9 elements with a swanky landing page design, and you get the perfect recipe for a lead generation machine. The only question is, what do you do with the e-mails you get? How do you take a lead list and turn it into sales, customers and referrals? The bad news is, the answers to these questions are outside the scope of this article.